Rogue One, a standalone movie outside, but very much in the Star Wars canon, has hit theaters and the the verdict is overwhelmingly positive. With its retro look that allows it to nicely dovetail into A New Hope, Rogue One: A Star Wars Story is filled with tips of the hat that have fans and newbies excited. However, amidst all this, the call for a standalone movie about Darth Vader has never been more palpable. In the first six films, Lord Vader is has been something of an enigma. Yes, we know his story. We get that it took Episodes 1-3 to show us how Anakin Skywalker became the world's most formidable villain in a shiny black suit. At the same time, as Rogue One has made abundantly clear, there are many unanswered questions between Episodes 3 and Episode 4. Some of them range from what what was Darth Vader doing that whole time? How was he dealing with, quite literally, becoming a machine? Where was the Emperor in all this? Did he have regrets? Did he share these thoughts with anybody? Was there a point where one of the Jedi was able to "read" his thoughts? As you can see, the questions abound. More specifically, Darth Vader, simply the image of this character, represents something. This character in the black helmet, with the black cloak, and the front chest piece that looks like a multi-colored telephone, is iconic. How is it that we have spent so many films with this character (technically 7 but 8 if you count how Darth Vader is alluded to in The Force Awakens) and we don't really know him? This is why a Darth Vader standalone movie is so necessary. It would answer many questions while hopefully maintaining and building on the mystique of this incredibly complex character. So sit back, make sure you have seen Rogue One, and enjoy 9 Reasons Why Darth Vader Needs His own Star Wars Spin-Off Movie. 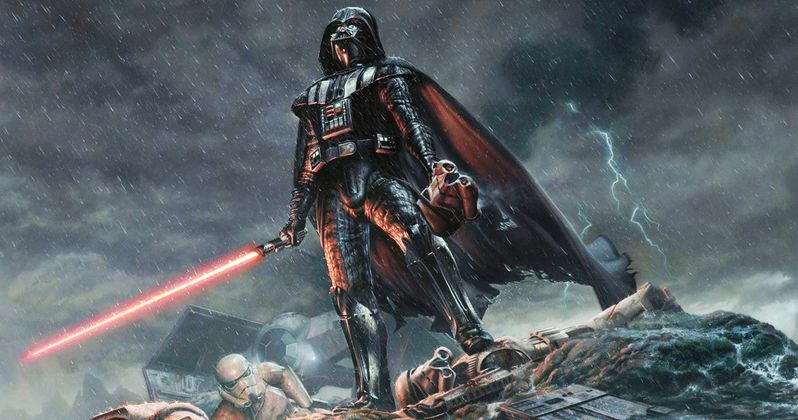 Darth Vader Is One of the Most Iconic Characters of All Time. Darth Vader is seen as so malevolent that the mere mention of his name denotes fear. He is a reference point. The embodiment of pure evil. Sure, moviegoers fear Jason Vorhees and Freddy Krueger, but that is fear on a different level. Those characters are given to moments of levity even though they are doing rotten things. The Dark Lord of the Sith never has a light moment. He is known for being cold and heartless. Darth Vader doesn't need to be calculating because he can do whatever he wants when he wants. There is nothing on earth that can stop him. They can try, as we see over the course of the films, but what it takes to succeed is almost insurmountable. This character is everywhere. In TV commercials, on cereal boxes, in print ads... and this is when there's no Star Wars movie in theaters! The time has come for the baddest man in the universe to be given his own film. To allow viewers behind the dark curtain that he has been cloaked in since he first appeared on screen in the 1970s.